The East West Rail Consortium plan to change the route of freight trains to and from Haven Ports; Felixstowe, Harwich and Ipswich to the West of Kennett station. In this document on the East West Rail Consortium web site, this is said. How would these changes affect Newmarket and the horse-racing industry in the town? How Many Freight Trains Are We Talking About? This table shows the number of freight trains going through Kennett station on the 1st of March 2019. In the table the first figure is the hour, the second figure is the number of freight trains going West and the third figure is the number of freight trains going East. This gives a daily total of eighteen trains going West and twenty-one trains going twenty-one trains going East. But these figures will increase! At present, Network Rail are adding a passing loop on the Felixstowe Branch Line. This article on Rail Magazine is entitled £60.4m Felixstowe Branch Upgrade Under Way and says this about the upgrade. Installing the new line will create capacity for up to ten additional freight trains, each the equivalent of 76 lorries. Not all will come via Kennett, as some will go via London. The Port of Felixstowe will get larger and other improvements on the route across Suffolk will increase the number of freight trains passing through Kennett station. I estimate that it is very likely that in a few years there will be two trains per hour (tph) in both directions for every hour of the day. Currently, these freight trains go via Ely, but the plan of the East West Rail Consortium would be to reroute all these freight trains through the Warren Hill tunnel and Newmarket station. I suspect the reasons for the change of route could include the following. If as expected the East West Rail Link joins the London-Cambridge Line just South of Cambridge South station, then the trains would run through Dullingham, Cambridge and Cambridge South stations, when running between the East West Rail Link and Newmarket station. Drive on a new motorway and the curves are smooth with relaxed gradients. A new railway will be like that too and less energy will be used to power trains along its length. There is a very complicated track layout at Ely and increasing the number of trains might be difficult or very expensive. Take going between the Haven Ports and Bristol or South Wales. Currently, these trains tend to go via London and in a couple of years will have to share tracks with London’s intensive Crossrail network between Acton Main Line and Reading stations. Using the East West Rail Link, the trains would join the Great Western Main Line at Didcot, a few miles West of Reading. How many services will use the East West Rail Link to by-pass London? Currently, these trains either go via London or take the slow cross-country route via Peterborough to Nuneaton for the West Coast Main Line. If they use the East-West Rail Link, they can join the West Coast Main Line at Bletchley. I think that as the years pass and more freight terminals are created, we will see more freight trains using the East-West-Rail-Link and many of these trains will go through Newmarket. What Problems Would The Rerouting Create In Newmarket? I can see these problems. Four freight trains per hour will create a lot of noise and vibration as they pass through. 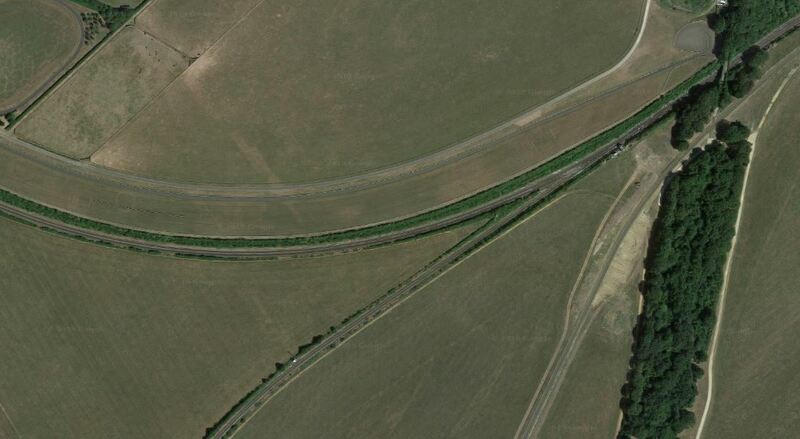 This Google Map shows a corner of the gallops at Newmarket. Note how the railway from the East splits into two, to the West of the band of trees running down the map. The top branch curves away to the North and goes through Soham to Ely. The bottom branch curves away to the South and goes through Warren Hill Tunnel to Newmarket station and then on to Cambridge. Alongside, the Southern route is the Al Bahatri all-weather gallop, which is an important facility for training racehorses. It can just be picked out as a sand-coloured line. Currently, nearly all the freight trains take the Northern route to Ely, keeping them away from the Al Bahatri. But, if the main freight route was through the town, as planned by the East West Rail Consortium, then at least four freight trains per hour would run alongside the gallop. There could also be four passenger trains per hour. It is unlikely, that the railway through Newmarket will be electrified, but under a different government, this could happen. It might add another dimension to disturbance through the town, as you get pantograph noise and occasional sparks and flashes. I don’t know how horses will react, but from my own experience years ago, they do react to electrical fields. 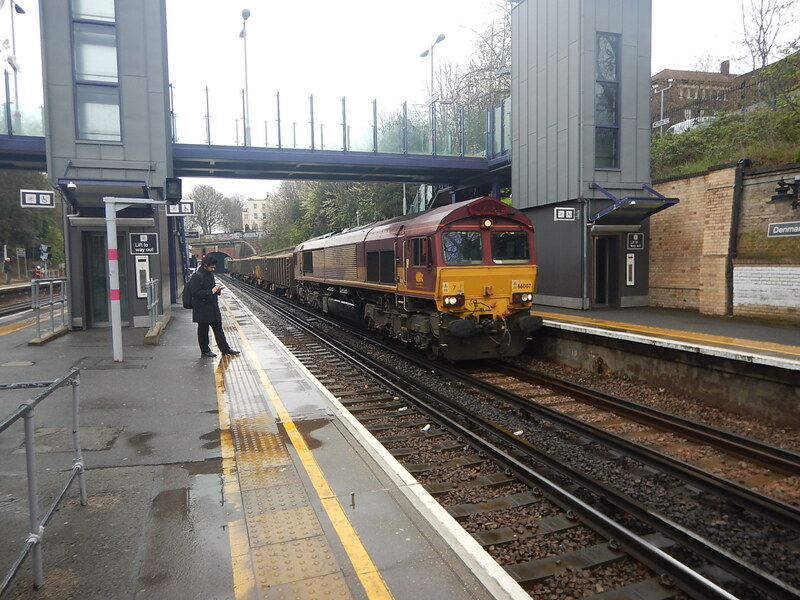 Look at most freight trains on the UK’s railways and the locomotive on the front, is a noisy, smelly and polluting Class 66 or Class 70 locomotive. You’ll see these American imports, which don’t meet the latest emission regulations, hauling freight trains, even when there are overhead wires for electric haulage. Because rail freight companies are so driven by accountants, that they can’t be bothered to obtain more modern diesel locomotives, that are quieter, more powerful and less polluting. 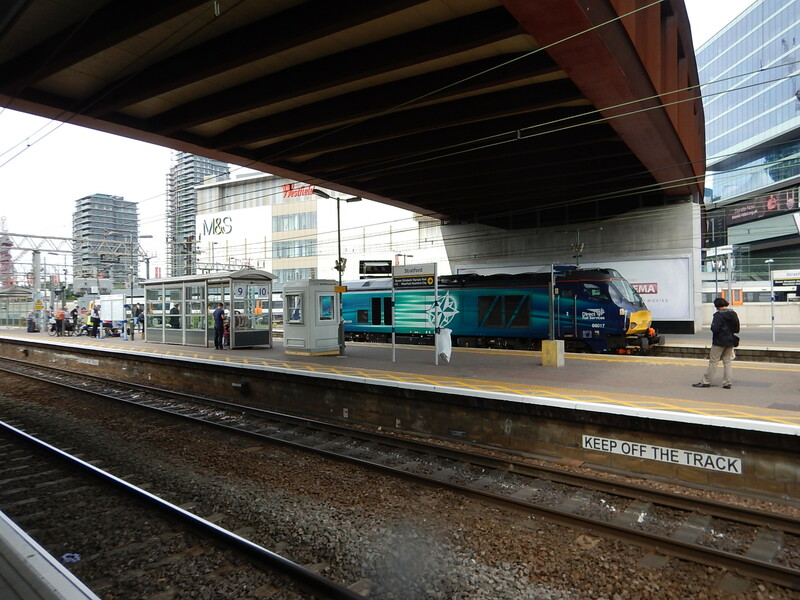 The picture shows a modern Class 68 locomotive at Stratford. These are quieter and meet most of the noise and emission regulations. I’ll deal with various methods, that could be used, starting with the easiest. It looks like the Victorian engineers, who built the railway through the town, built it as level as possible, so that steam locomotives didn’t have to work so hard in the Warren Hill Tunnel, which I don’t think has a chimney for smoke. Modern engineers will ensure that the railway is as level as possible, with gentle gradients and curves all the way between Kennett and Dullingham stations. Greater Anglia’s new Class 755 trains are powered by both overhead electrification and onboard diesel engines. The latter sit in a power pack in the middle of the train. Not having seen or heard one of these Swiss-built trains in the metal, I can make no comment as to the noise and vibration of these trains, but they should be quieter than the current three-car Class 170 trains. It does appear that passenger trains built in the last years are much quieter, as they are much more aerodynamically correct and slippery, so they generate less noise. The new trains have also been ordered for the South Wales Metro. But the Welsh trains will additionally be fitted with batteries to avoid some difficult electrification in the Valleys. So if the passenger trains prove to be noisy through the town, which I doubt they will be, there will be the option of adding batteries to avoid the use of diesel power. It is my belief, that technology will ensure that passenger trains will not be a problem. As I said earlier, smelly, noisy and polluting freight locomotives are a big problem. This is not just a problem for places like Newmarket with special circumstances, but on railways like the London Overground and those in Central Birmingham, Leeds and Manchester,, where suburban electric railways have to accommodate heavy rail freight. The railway locomotive manufacturers have designed solutions for the problem in recent years. Stadler, who are an innovative Swiss company have started to manufacture a Class 93 locomotive, which can run on diesel, electric and/or battery power. I’m fairly sure, that one of the design goals of this locomotive is to be able to haul a heavy freight train between Felixstowe and Peterborough, using electric power where it is available and a mix of diesel and battery at other times. At Newmarket if the new double-track was well-designed and almost level, I suspect that a Class 93 locomotive could haul a train between Kennett and Dullingham stations on battery power. Locomotives of this type should be compulsory on all freight routes through sensitive areas. The government must legislate, as left to themselves the rail freight companies will sit on their hands and wallets. One of the conditions of a double-track railway through Newmarket, should be that only locomotives that meet the latest noise, vibration and pollution standards, like the Class 93 locomotive should be allowed. Karl Watts, who is a disruptive innovator and CEO of the Rail Operations Group, has bought the first ten Class 93 locomotives and intends to use them to haul 100 mph freight trains, where the routes allow. On the electrified Great Eastern Main Line between Ipswich and London, the operating speed is 100 mph. But freight trains trundle up and down at 75 mph, thus slowing all of the passenger services. Watts plans to use the Class 93 locomotives with new 100 mph container wagons to run freight trains at 100 mph on this and other routes, which would increase the freight and passenger capacity of the line. New 100 mph freight wagons will be smoother, quieter and used through Newmarket at an appropriate speed would remove a large proportion of the noise and vibration. Again, it would need investment from the freight companies. However, modern freight trains hauled by modern hybrid locomotives like the Class 93 could significantly remove noise and vibration. A second bore will be dug to double-track the kilometre long Warren Hill Tunnel. Some rail tunnels have been extended with covers and this technique might be possible at the Newmarket station end of the tunnel. The techniques exist, so that housing or other developments can be built on top of the railway. Techniques like this not only suppress noise and vibration, but create much needed housing. You see these a lot in Germany to reduce noise and vibration from railway lines in sensitive area, but rarely in the UK. It will be difficult to put a double-track railway through Newmarket, but I believe that using modern rolling stock and some advanced construction, that a solution can be found. Newmarket should dig in its heels and only accept the best to force rail freight companies to get their act together. Government too, should enforce the current regulations on diesel locomotives, which most of the current locomotives do not meet.